Kelly Galea is a crusader for creative expression, helping seekers and doers find more freedom, flexibility and fun in life and business. 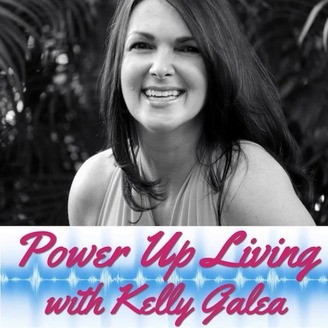 Join her weekly for Power Up Living to tune into the possibilities and amplify your life! A multi-passionate entrepreneur, business strategist, author and speaker, Kelly currently lives in Orlando, Florida with her husband, their boxer and two kitties. Join host Kelly Galea for this episode where we’re talking about something that feels foreign to many driven professionals ... REST! We’ll cover: What it means to restSigns you need restBenefits of restWhat gets in the way of embracing restWhat you’re likely to experience as you choose restHidden gifts of restWays to incorporate rest in your life & business About Your Host Kelly is a crusader for creative expression, helping seekers and doers find more freedom, flexibility and fun in life and business. Get ready to tune into the possibilities and amplify your life! A multi-passionate entrepreneur, business strategist, best-selling author and speaker, Kelly currently lives in Orlando, Florida with her husband, their boxer and two kitties. Visit her at http://www.KellyGalea.com.